This page is about the Russian attacker IL-10 (1946). For the other version, see IL-10. 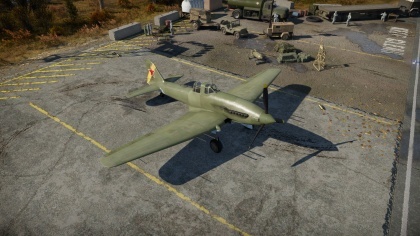 The IL-10 (1946) is a rank IV Soviet attacker with a battle rating of 5.0 (AB) and 5.3 (RB/SB). It was introduced in Update 1.41. As a continuation of the famed Ilyushin IL-2 series, the IL-10 (1946) is a highly upgraded version of the classic Soviet ground attacker of World War Two. Unlike its predecessors, who wield a pair VYa 23 mm cannons, the IL-10 (1946) utilizes four NS-23 23 mm cannons which increase the plane's anti-aircraft capabilities, at the expense of anti-armour stopping power (31 mm -> 21 mm). The IL-10 (1946) is also highly capable of defending itself from the rear, unlike its earlier relatives which wielded a single 12.7 mm Berezin UB machine gun. This aircraft boasts a 20 mm Berezin B-20 cannon capable of ripping would-be killers apart. Although extremely dangerous in a low-speed and low-altitude dogfight, this aircraft suffers at both higher altitudes and higher speeds, where post-war fighters such as the F8F-1B have the advantage. The IL-10 (1946) also features an armoured cockpit and engine, which increases the aircraft's resistance to sub-calibre armour piercing rounds. Thus, just like its earlier relatives, the IL-10 is a very heavy aircraft which can hurt performance aspects such as acceleration. The IL-10 (1946) wields an impressive armament of four 23 mm NS-23 cannons, placed in the wings. While not capable of destroying heavy ground targets, these cannons are extremely deadly to single, twin, and quad-engine aircraft alike. The rounds have a fairly slow muzzle velocity, however, so it is crucial to lead the target properly, especially in a dogfight. Equipping the "air targets" belt is the best choice as it serves the both light-ground attack and anti-aircraft roles very well. 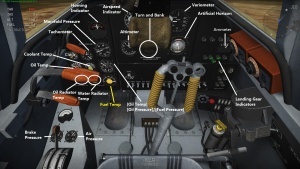 Cockpit with English labels. It is quite cramped, but features more visibility than the earlier IL-2. NS-23 cannons are not capable of destroying medium or light tanks even with AP ammunition. This severely hinders the aircraft's ground attack capabilities, so it is best utilized as a multi-purpose aircraft similar to the B7A2 Ryusei. However, it is worth noting that this aircraft wields the ability to carry a varied payload of both bombs and rockets. With proper aim, it is possible to destroy heavy tanks albeit very difficult as there is no bombing reticule. The "air targets" belt for the 23 mm cannons have the ability to demolish soft ground targets such as armoured cars and AAA units, but also retains the ability to destroy fighters and bombers alike with only a handful of rounds. Therefore, it can be beneficial to first attack the enemy's light defences and then if a teammate has been forced to a lower altitude by a pursuer, attempting to alleviate the stress of that pilot can be beneficial. Like the La-9, the IL-10 (1946) has the ability to fire two of it's 23 mm cannons instead of four as the ammunition pools are separate. A good strategy is to use one set of 23 mm belts for attacking ground targets, and the other for destroying enemy aircraft. 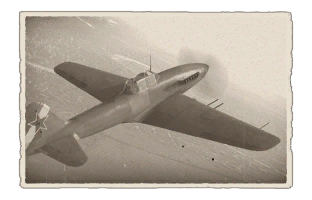 If found in a sticky situation, the IL-10 (1946) pilot may choose to call for help or to "roll the dice" and use the 20 mm tail cannon. While it is effective, hitting the enemy at longer distances can be very difficult, especially without the "new 20 mm cannon (turret)" module upgrade. It is best to lure an enemy by turning and evading their fire and then lining them up directly with your tail cannon. It is possible to destroy the enemy aircraft with less than 10 shells if they are very close and the tail gunner is accurate. Another unorthodox method of using the 20 mm tail cannon involves a situation in which an initial pass on a ground target failed. Depending on how close the IL-10 (1946) is to the ground target, it is possible to destroy it from behind with the 20 mm tail gun. This is very difficult especially as the distance from the target increases. Since the IL-10 (1946) is a multi-role aircraft any module research path is viable. Unlocking performance modules will boost survivability and damage potential in dogfights, whereas unlocking armament modules will help with the ground attack. Some of the best modules to unlock are the "engine injection" and "offensive 23 mm belts". Any of the turret upgrades will also improve potential damage output. NS-23 still does not have the penetration to damage medium tanks, even with API-T at optimal angles. This page was last edited on 24 March 2019, at 11:01.